a Fintech institution registered offshore to provide research, financial partnerships to blockchain start ups and in housed developers in AI Application in trading. The only reference to a corporate address is in Bitdax Global’s Terms and Conditions. The UK address provided however belongs to Blue Square Offices, a virtual office provider. Bitdax Global do provide names and photos of executives on their website, however these are just as vague as the company’s description of itself. Andrew Savvides and Robert Slattery are cited as founders of Bitdax Global. Andrew Savvides (right) appears to have a history pushing forex schemes (binary options). With Bitdax Global he’s now focusing on cryptocurrency. On his Facebook profile Savvides claims he’s living in London, UK. Robbert Slattery meanwhile is a complete mystery. I was unable to find any external information on him, which I’m flagging as suspicious. On the marketing front Bitdax Global is primarily targeting Africa. At the time of publication Alexa cite Ghana (58%) and Nigeria (20%) as the top two sources of traffic to the Bitdax Global website. Marketing material suggests Andrew Savvides personally attended Bitdax Global recruitment events in Nigeria in late May. Read on for a full review of the Bitdax Global MLM opportunity. Bitdax Global has no retailable products or services, with affiliates only able to market Bitdax Global affiliate membership itself. Bitdax Global affiliates invest $50 or more worth of cryptocurrency on the promise of a 5% weekly ROI for 200 days. ROI payments are made in an internal Bitdax Global token, which affiliates convert to bitcoin or ethereum through an internal exchange. 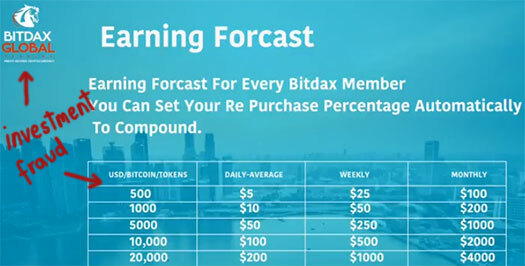 Bitdax Global affiliates can also auto reinvest their ROI payments to generate more tokens. There are five affiliate ranks within the Bitdax Global compensation plan. Bitdax Global affiliate investors can qualify for bonus tokens by recruiting new investors. The Bitdax Global compensation plan represents bonus tokens are initially awarded at a rate of 50% of tokens invested in by personally recruited affiliates. Higher ranked affiliates are awarded bonus tokens through a unilevel compensation structure. Bonus tokens pay a 0.5% daily ROI. The Global Mining Pool is a monthly pool made up of 5% of Bitdax Global’s company-wide revenue. Bitdax Global affiliates who invest and/or reinvest in 5000 or more tokens in a month receive a share in the Global Mining Pool for that month. Bitdax Global affiliate membership is tied to a minimum $50 investment in tokens. Bitdax Global claim to generate external ROI revenue through a “unique Grade A classified trade algorithm” that was originally developed for “the stock and forex market”. No evidence of the algorithm existing or any trades being made with it are provided. Furthermore Bitdax Global’s business model fails the Ponzi logic test. If the secret algorithm is successful when applied to forex, why is it being repurposed for cryptocurrency? Surely Andrew Savvides should be plenty rich by now and have no need to drum up investment from gullible Africans? As it stands the only verifiable source of revenue entering Bitdax Global is new affiliate investment. Using newly invested funds to pay existing affiliates a ROI makes Bitdax Global a Ponzi scheme. In reality Bitdax Global tokens are worthless outside of the company itself. The tokens primarily serve as a vehicle for gullible investors to hand over bitcoin and ethereum to Savvides. Through Bitdax Global’s internal exchange, Savvides will continue to pay ROI withdrawals until a minimum amount is triggered. That will coincide with a decline in affiliate recruitment, which starves Bitdax Global of ROI revenue. Savvides then does a runner with what’s left, leaving another wave of gullible African investors wondering where their money went. We’ve seen this play out time and time again as cryptocurrency awareness spreads throughout the continent. Time to stop falling for it guys. ANDREW SAVVIDES scamed a ton of people in the binary options arena. He’s nothing but another fraudulent scam artist out to steal your funds, steer clear of this convict. Andrew is not scam at all. He is an educator and businessman and a great forex trader too. He doesn’t steal funds. Can’t run a Ponzi scheme without stealing funds. Time to accept reality. What is this miraculous bank that pumps out a 126% annual ROI, beating out the world’s most profitable hedge funds? And the rate of return doesn’t make Bitdax Global a Ponzi scheme, the use of newly invested funds to pay off existing investors does. Is it the ‘Bank of the Easter Bunny’ or ‘Santa Claus Savings & Trust’ ? Lets not insult everyone’s intelligence with ridiculous claims. Andrew Savvide is never a scam artist. Andrew has always spearheaded Global education on Forex trading. Hi Andrew. The fact of the matter is Ponzi schemes aren’t started by reputable people. Now that Bitdax Global has collapsed, Andrew Savvides has reached out and is claiming he’s not co-founder of the company. When pressed on who the owners are, Savvides failed to provide any answers. Instead he did a song and dance about going to the police and regulators – to which we gave him our blessing to follow through with. I did ask for permission to update the review with his denials but Savvides didn’t want to go on the public record with his claims. In any event I’ve archived our email correspondence and will publish it in the future if need be. Savvides has been advised of the same.